In combination with the infrared thermometer CS, the TM temperature monitor from optris provides an innovative stationary measurement system for an ongoing monitoring of temperatures. Offering 12 measuring points, it is suitable for temperature measurements at large or hard to access facilities, where current carrying or moving objects need to be monitored without contact. 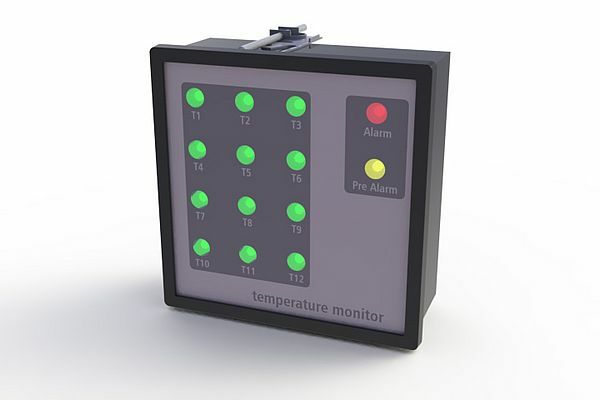 Installed in switchboard doors or panels, the temperature monitor has a separate LED indicator for each of the measuring points. The LEDs show different condition and the monitor additionally offers a yellow (pre-alarm) and red (alarm) LEDs that signal critical condition of a measuring point. The critical condition signals are also transmitted through external relays. A rotary switch at the back of the monitors allows a simultaneous reprogramming of the connected CS sensors if parameters are changing. Nine alarm threshold values - which can be defined upfront - can be allocated to the sensors.